Email marketing, also known as ‘list building’, can deliver significant results at a very low direct cost. 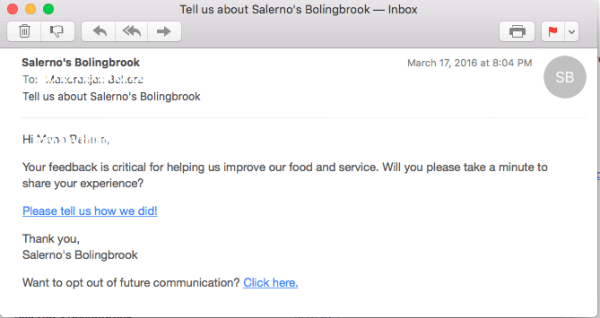 Why restaurant email marketing should be a core phase in your marketing plan of attack. You can target a ‘warm audience’ at any time. It’s quicker and cheaper than direct mail, long a key marketing tactic for pizzeria owners and marketers. Email can be efficient because of automation. Email marketing can be very focused because of segmentation. Marketing through email can and should be a very personalized form of marketing. Why is your restaurant’s email marketing plan important? Like most marketing tactics, the benefit is to deliver an audience back to your core presence, which is usually a website. This is because they show up in local search where Facebook fan pages do not. One of the best ways to get them to return to your website (or Facebook page) is by sending them an email offering a reason why. Many restaurants are relying on Facebook as their only digital presence. Very few restaurants have a dedicated online engagement strategy with their customers outside of Facebook. With engagement on Facebook becoming more challenging due to declining organic reach, these restaurants could be losing connections with their customers. Being able to communicate with people familiar with your brand, who have self-identified as interested in your offers is a valuable asset. The market research firm Forrester, published a report titled, “Social Relationship Strategies That Work.” In the report, it says that brands are wasting time and money on Facebook and Twitter. “Stop making Facebook the center of your relationship marketing efforts,” says Nate Elliott, VP and Principal Analyst at Forrester. He says the use of microsites and email marketing are an integral part of a well-rounded digital marketing plan. Investing solely in social media marketing without an email strategy is a wasted opportunity and an incomplete marketing plan. Your goal is to reach as many consumers as possible who are in a position to buy for pickup, delivery or in-house. Email allows you to reach them on mobile whenever you like. Email is one of the best ways to reach your customers. With the growing use of smartphones and easier access to email inbox, email marketing is not just highly relevant but a crucial element of digital marketing plan for today’s restaurants. Sure, direct mail is effective but email gives you more options including lower cost. The most basic form of email marketing used by pizza purveyors is to simply offer deals, just as you might with a postcard. An email list is one of the most effective channels to deliver offers and promotions. Make sure people have current menus while incentivizing them to be on your list by giving them special offers beyond the pizza promotions available publicly. Any promotions will be well received by your customers and it may even bring them in that day to take advantage of your specials. In an age where everything is costing more and more money and even Facebook isn’t free anymore, it’s refreshing to know that you can still use an email marketing campaign as part of your restaurant marketing methods. Consider this; a television commercial can cost thousands, a radio spot can cost hundreds, but an email is free to send and it doesn’t take much effort beyond a carefully developed plan to do so. The key to effective email marketing is “segmentation” and “personalization”. It is important to understand that not all restaurant customers are the same. Each group of customers will have different needs and interests. Segmentation is the key to identifying these groups so that we are able to serve our customers better. Segmenting the email list will help to get better open and click rates and ultimately better response to the restaurant offers and promotions. Customers who have ordered online. People who have responded to different offers, whether generated internally or by a Groupon. Those who signed up for free pizza on their birthday and anniversaries. Gone are the days of “email blasts”. They are no longer effective and mostly land in a spam folder. Personalization is simply designing your email to address the customer in a personal manner. That is possible when you have additional information about them such as name, age, interests and behavioral information. Personalizing emails by addressing with a name is a simple good start at personalization. Next step is delivering “relevant” email content based on the interest or behavior. For example, offering a “diner for 2” might not be relevant for customers who usually order online. Other personalization techniques can be implemented based on the segmentation we discussed earlier. Restaurant email marketing takeaway: Deliver frequent, regular and relevant offers and promotions through email. Use email list segmentation and personalization to optimize your deals and promotion campaigns. When visitors land on your restaurant’s website for the first time, do you have an effective way to reach those visitors again or do you just let them choose to click elsewhere? At this point you have invested in organically or paid advertising to drive traffic to the restaurant website, it makes sense to capitalize further. Taking control of your website visitor’s browsing habits can be as easy as catching and holding onto their attention. Keep them engaged on your site and guide them to click on opt-in either as an embedded form on the website or popup after a preset delay. The best way is to incentivize them with a ‘lead magnet’ by providing something of value. Value can be the promise of deals and special promotions in exchange for their email address. Another incentive is to offer them a FREE giveaway that they can immediately download by providing their email address. This giveaway could be a recipe, coupon, food tips or a simple checklist. Email provides an easy way to build your customer list and retarget website visitors effectively through well-designed email marketing campaigns. Restaurant email marketing takeaway: Capture the email of website visitors through a “Join Email List” opt-in form on the restaurant website (and a delayed popup form) and offering a FREE giveaway incentive. Engage with your email subscribers through email nurture campaigns. If your restaurant has a customer loyalty program or is thinking of having one in the near future, the email list is absolutely essential to the success of that program. Many customers will dine in an establishment that caters to their needs, treats them well and remembers who they are when they come in. A loyalty program does all of that and more and gives you the chance to add another email to your growing list. When you send out loyalty program updates, be sure to include your monthly specials and events that you are holding. It is an easy way to get your regulars to stop in even more frequently. Restaurant email marketing takeaway: Make the customer loyalty program and email marketing work together to create an effective marketing campaign for customer engagement. If your restaurant offers online ordering, you most likely have the customer email addresses from orders received by the restaurant. If not, determine a way to capture the email address at the end of the online order checkout process. This form of segmentation provides a great opportunity to rapidly build your email list and engage with customers in multiple ways. The first step is to engage with the online ordering customer shortly after the order fulfillment process is completed to solicit feedback on their experience. This can be set up in your email auto-responder system within online ordering. It is so valuable for the restaurant to receive this active customer feedback to respond to any concerns and ensure customer satisfaction. This leads to repeat business and positive reviews and ratings. Here you are leveraging email for proactive Customer Relationship Management, improving operations and restaurant reputation management. This is one of the most effective restaurant email marketing strategies that every restauranteur should adopt right away when offering online ordering. 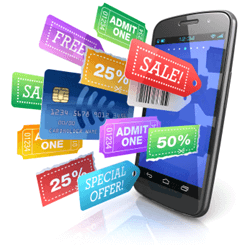 Another effective tactic is offering customers who order online special offers that are relevant to them. With a well-configured email auto-responder system, you can set up to automatically follow up through email. You can target the various online ordering customers segments such as frequently ordering customers (E.G. more than 4 times a month), customers ordering over a certain amount (E.G. $300 over the last 30 days) and even customers who have not ordered within a certain period of time (E.G. 60 days). Finally, you can send various promotions to your online ordering customers that are relevant to events and seasons, such as sports events, holidays and seasonal promotions. Restaurant email marketing takeaway: Capture your online ordering customers email through email opt-in during online ordering. Get feedback and retarget them through specific email offers and promotions. Many restaurants run Groupon deals to attract customers to the restaurant, but most of those restaurants do not have a strategy to further engage with these customers, thereby losing out on a significant opportunity for repeat customers. By providing a way to effectively capture the email addresses of those dining customers, you are better able to communicate with that segment of customers and get them back in your dining room. Many Groupon users admit to being “one and done” customers and only showing up for the deal. What today’s restaurant owners need to do is offer them a deal that will bring them in and then provide them with the type of service to bring them back. This can also work by obtaining their email addresses either through the use of comment cards or table-side email sign-ups. Now you can offer them deals to come back and remind them of monthly promos that you are running. Restaurant email marketing takeaway: Capture email address of first-time Groupon users. Convert first-time visitors to repeat customers by engaging effectively through email marketing. Listbuilding isn’t always done with email. Your followers on social media could be considered a list. Visitors to your website can be pixeled and re-targeted using Facebook or Google or other means and can be considered as being on your list. They are also part of a different and important segment. We’ll have more on re-targeting in another article, but let’s look at using your email lists to target buyers using Facebook ads. If Facebook is your favorite platform for social engagement and you know that ‘organic reach’ is declining and that you have to pay to reach your fans, what do you do? You need to make the most of your advertising budget by targeting your customers via Facebook’s custom audience options by leveraging your current email list to build this targeted group. Create a list of email addresses from your restaurant email list in csv format. You can also use phone numbers. Or both! Go to Facebook Ads manager and click on the Audiences tab (the Facebook interface keeps changing, so find the Audience tab, if this changes). Click the Create Audience button, select the Custom Audience option and then choose Customer List. Your Custom Audience will be ready in about 30 minutes. You can now advertise to people who are on your email list for increased frequency of your message. Promote new items or new menus, promotions and events. An example of how to leverage custom audiences is an event hosted by the restaurant. Using a targeted Facebook advertising to a custom audience build out of the restaurant customer email list, you can promote and sell tickets to the event. Another example is when the restaurant is launching new menu items. Again, using targeted Facebook advertising that has been built out of your current restaurant’s email list, you can effectively announce to a hyper-targeted customer base. Use Facebook Ads to Build Your Email List! Contact us to find out how. Restaurant email marketing takeaway: Create custom audiences on Facebook using your email subscribers list. Reach your customers effectively and at a lower cost by hyper-targeting. We refer to “push messaging” marketing to include both SMS marketing, web and mobile app notifications. It is important to understand that “push messaging” marketing messages are delivered ‘pushed’ to the user without any user control of when they want to receive it. It could be potentially interrupting the user. Compared that to “pull” such as in email where the user receives the messages when they choose to. For those restaurants employing SMS marketing, it is important to understand the right level of engagement for those SMS marketing messages. The frequency and content of SMS marketing need to be carefully determined; when not done right, SMS marketing can quickly annoy your customers. If your restaurant offers a mobile app that has the capability to push offers, we have to be careful to determine the right frequency of messages so as not to irritate our customers. 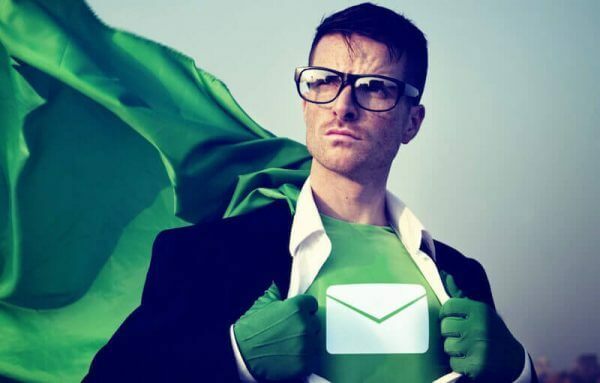 Leveraging email marketing with push notification marketing helps find the right balance and increases the efficiency of your marketing campaigns. Let’s take the example of running a marketing campaign related to an event. You could send multiple marketing messages weeks and even months ahead of the event registration deadline through email but 24 hours before the deadline you can use SMS or mobile app messaging to remind customers to register before the deadline. This is one of the restaurant email marketing strategies for striking a balance in your marketing messaging. Restaurant email marketing takeaway: Augment push notification marketing with email marketing to maximize customer engagement. Getting started with implementing restaurant email marketing strategies can be as simple as choosing an email service provider. Next is putting up email sign-up form on the restaurant website and Facebook pages. Then, it is important to grow and nurture the email subscribers list in an ongoing manner. In summary, email marketing provides a very effective marketing channel and augments other marketing efforts to maximize the marketing results. For restaurants considering having an effective digital marketing plan, email marketing is really the 2nd piece (website being the first) to implement in the restaurant marketing strategy. With any marketing channel you use, you need to have email as your foundation to maximize your return on your marketing budget. Are you using email marketing at your restaurant? If so, what restaurant email marketing strategies are working for you? What are your challenges? We would love to hear from you; use the comment section below to share your thoughts.